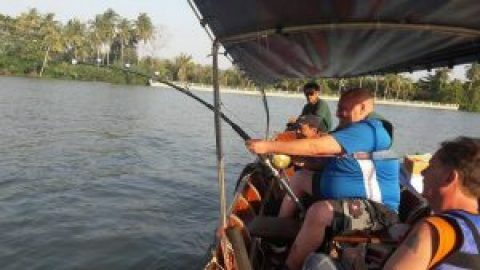 Brendan and Rusty traveled to Ratchaburi province in the evening ready for an early morning start predator fishing at IT Lake the next day. An early morning start saw the anglers using spinning outfits in an attempt to lure some of the many predatory species present in the lake. Using a combination of diving and sinking lures the anglers began to make exploratory casts to various parts of the lake. On the third cast Brendan’s rod hoped over as a large predator slammed aggressively into the bait! Setting the hook into the fish saw a massive swirl in the water as a large Redtail propelled the fish away from the anglers. Winding down hard into the fish saw the fish change direction before once again charging to the centre of the lake. A fifteen minute battle ensued which saw the fleeing predator almost spool the angler on several occasions. 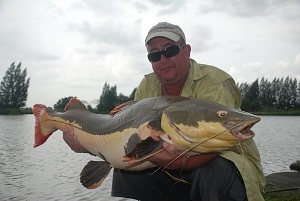 The fish was finally netted soon after revealing a monster sized Redtail Catfish of well over 30kg’s. With live baits being hurled into the lake at regular intervals the predators began to visit the area in large numbers. Both anglers received takes simultaneously as they cast their lures amongst the hungry predators aggressively competing for the small Tilapia livebaits. Rusty carefully played out a Giant Snakehead which had fallen for a Cultiva diving lure whilst Brendan once again battled a Redtail Catfish on his battered Rapala lure. The action continued throughout the day seeing Arapaima, Alligator Gar, Pacu and Asian Redtail Catfish all captured on a variety of lures. Regularly changing the pattern of their lures the anglers continued to outwit the predators and soon amassed a massive sixty fish haul. 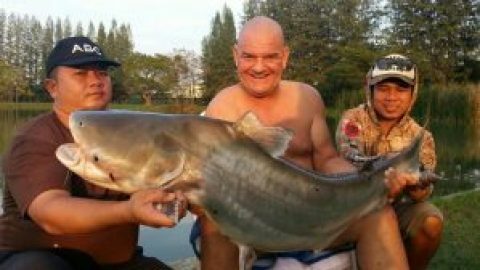 The record breaking predator haul included 23 Redtail Catfish with weights ranging between 10-30kg’s in addition to small Arapaima to 20kg’s, Giant Snakehead to 4.5kg’s, Asian Redtail Catfish to 12kg’s , Pacu, Barred Sorubim to 10kg’s and several other predatory species. The highlight of the day was the capture of a monster sized Spotted Sorubim of an estimated 28kg’s captured by Brendan on his trusty Rapala surface lure.